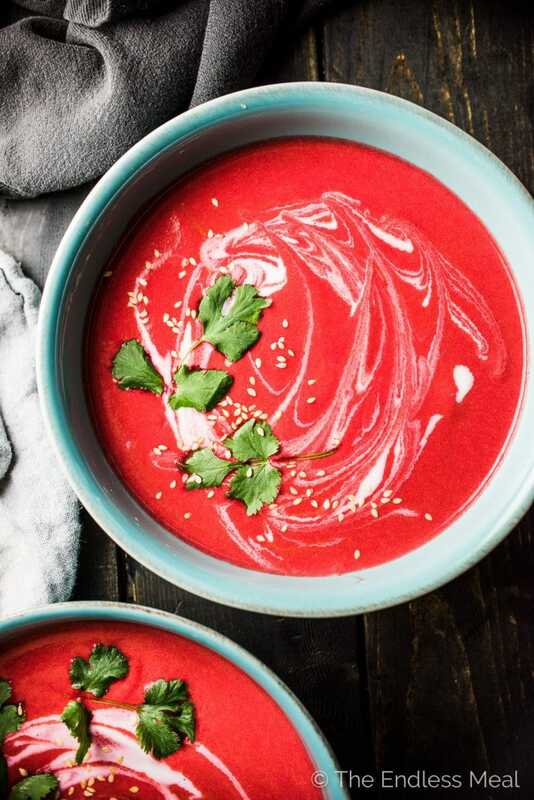 Want an awesome beet soup that will rock your world? This Coconut Thai Borscht has your name on it. It's made with typical Thai flavors like ginger, garlic, coconut, and lime and the not so typical beets. The combination is incredible. It's an easy to make healthy recipe you will LOVE! Just look at that color!!! ??? I'm not usually such a pink girl, but that bowl of brightness has me changing my ways. Isn't it so pretty? It's seriously the most Valentine's Day appropriate soup I've ever laid eyes on. So for all things pink and pretty today, let's eat Coconut Thai Borscht! And let's eat it anytime we need a splash of color in our lives/ warming up/ a delicious bowl of soup. I have a theory about Thai curry pastes. Want to hear it? I think that the best pastes have the least amount of English on the packaging. That's how I choose which brand to buy and it's always worked out for me. The jar I normally reach for wasn't on the shelf when I went shopping. 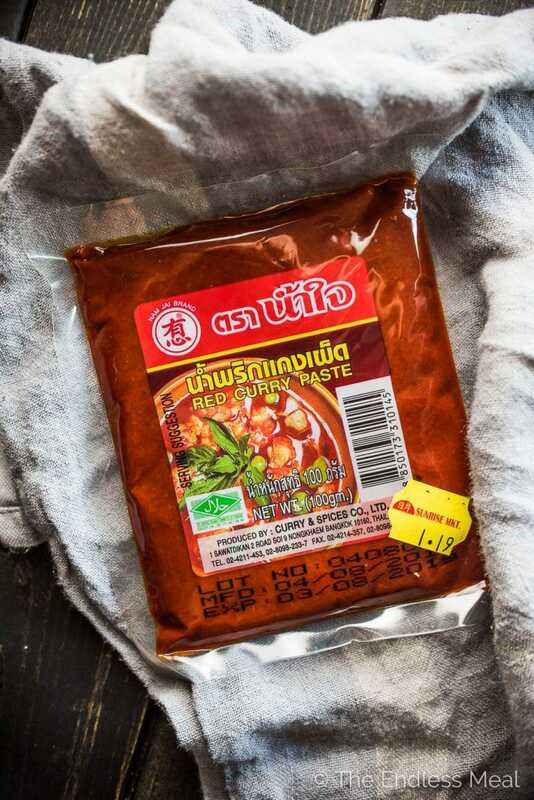 That little package up there with lots of Thai writing on it is super flavorful. If you can find it where you shop, definitely pick it up. If not, look for as little English on the package as possible. Side note – that brand up there (Nam Jai Brand) has Whole30 compliant ingredients. ? 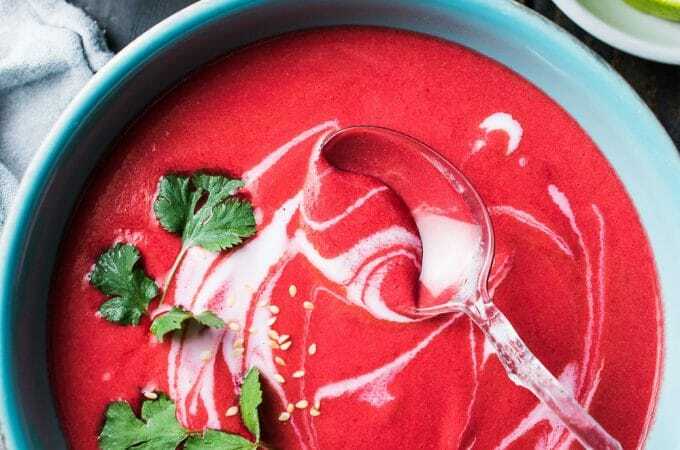 If you love this Coconut Thai Borscht as much as I do, make sure to give it a 5-star rating in the comments below! Heat the coconut oil in a large pot over medium-high heat. Add the onion and let it cook until soft and starting to brown, about 5 minutes. Add the ginger, garlic, and Thai curry paste and cook for 2 minutes more. Add the beets and stock to the pot and bring it to a boil. Reduce the heat and simmer for 20 minutes, or until the beets are soft. Transfer the soup to your blender (or use an immersion blender) and blend on high until smooth. Return the soup to the pot and add the coconut milk and lime juice. Season to taste with sea salt then serve the soup with any or all of the toppings. I’m so happy I made this. So much flavor and it’s so pretty. Great for beet season! Yaaa! I’m really happy to hear you like the recipe!! I love beet soup, but I’ve never had one like this. Thanks for the recipe! You should totally try it! It’s so good!